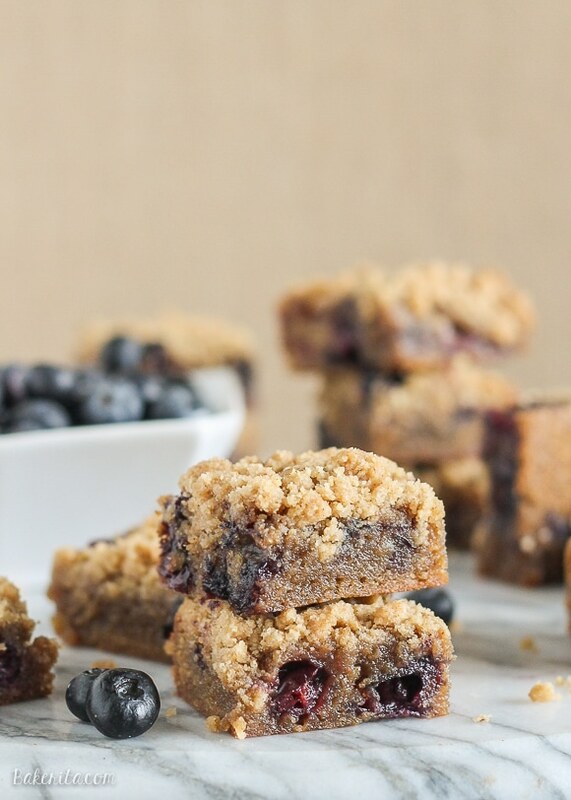 These Blueberry Crumb Blondies have browned butter, fresh blueberries, and a fudgy texture. The crumble topping makes these taste just like blueberry crumb muffins! 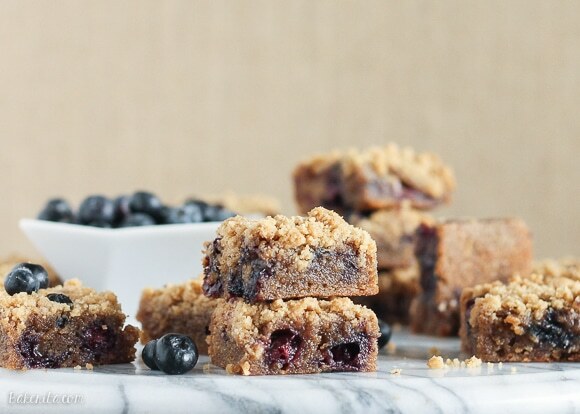 I have some major feelings about these Blueberry Crumb Blondies. Really, really good feelings, that make me want to bake a gigantic batch of these so that I have enough to hand one to each of you. Whenever I make a batch of blondies, I remember how much I love them, and why. They’re seriously so easy. Anything that doesn’t require a mixer and can be made with just a bowl and wooden spoon scores major points in my book. These bars go from start to oven within about 10 minutes. That scores big points in my book. Easy = awesome. There’s a few things particularly about these Blueberry Crumb Blondies that make them ultra outstanding. First, they use browned butter. I’m a firm believer in adding browned butter to all things. It will make your house smell like a dream. If I ever start a candle company, brown butter is the first flavor on the list. It adds a rich, buttery, toffee-like element to the blondies. They’re almost fudgy in texture, and the chewy edges get caramelized with that incredible brown butter flavor. 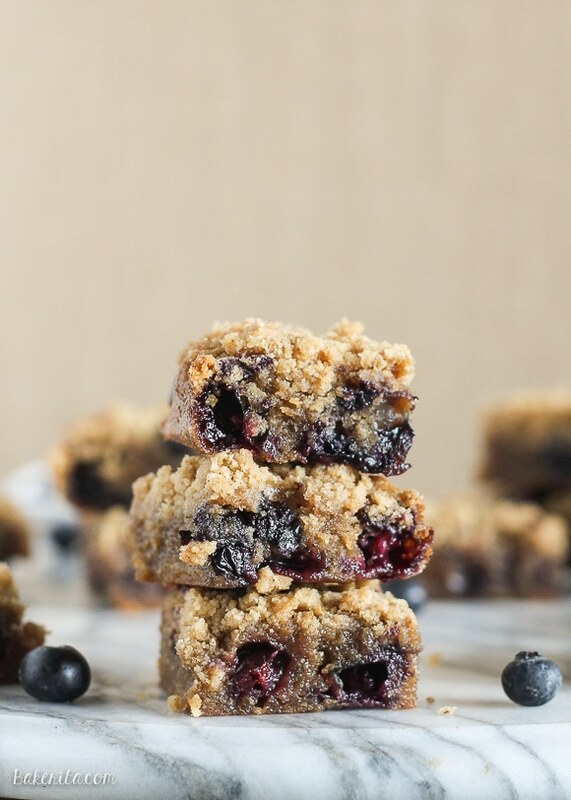 The blueberries add a burst of freshness to the bars that help lighten up the richness from that browned butter. I used fresh, but frozen berries would work fine here as well. Finally, that crumble topping! 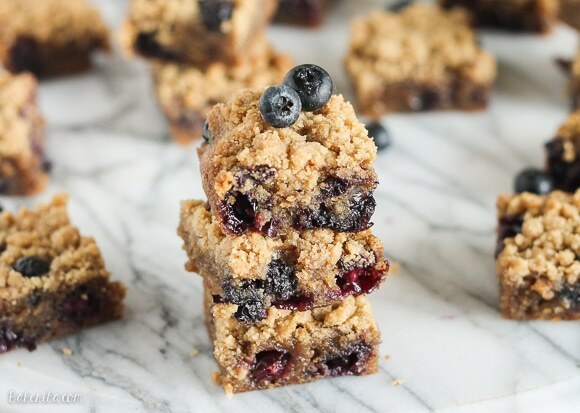 The crumb topping, similar to the crumb topping you would find on a muffin, combined with the blueberries, makes these bars taste seriously just like blueberry crumb muffins. I couldn’t stop taking bites of these bars. They reminded me of ripping into a steamy, fluffy muffin, but with the texture of a brownie. These bars are definitely one of my personal favorite things to come out of my kitchen recently. They’re seriously irresistible! Give these Blueberry Crumb Bars a go and you’ll see what I mean :) enjoy! Preheat oven to 350°F. Line an 8x8" pan with aluminum foil or parchment paper and spray with cooking spray; set aside. Place butter in a medium saucepan and heat over medium-low to medium heat. Butter will melt, then begin to bubble and foam. Brown specks will begin to form in the bottom of the pan, with a white foam will appear on top of the melted butter. Stir the butter very frequently to prevent burning. It should smell very nutty and the butter in the bottom of the pan should have brown flecks in it. This process should take 2-4 minutes. Butter can go from being browned and nutty-smelling to burnt and inedible in less than one minute. Watch for the brown specks and once you see them, remove the pan from the burner, continuing to whisk for another 30 seconds. Transfer butter into large mixing bowl and allow it to cool for a few minutes. Add the brown sugar to the browned butter and whisk to combine. Add the egg, vanilla, and whisk to combine. Add the flour, salt, and cinnamon and stir until just combined, taking care not to over-mix. Fold in the blueberries. Pour batter into prepared pan, smoothing it lightly with a spatula or offset knife. Make the crumble topping. In a medium bowl, combine the flour, brown sugar, and baking powder. Stir in the melted butter, then press the mixture together to form clumps. Sprinkle evenly on top of the bars. Bake for about 20 minutes, or until the bars are set and golden brown. The edges will be slightly pulling away from sides of pan. Allow bars to cool for at least 2 hours before slicing and serving into 16 squares. I like to refrigerate them before cutting to make them easier to cut. Bars can be stored in an airtight container at room temperature or in the refrigerator for up to 1 week, or in the freezer for up to 3 months. I adore blueberry desserts and that fact that it’s easy makes it a definite winner! These look amazing!! I love blueberry in anything so this is definitely on my must make list! I love blueberry desserts anytime of year! These look so delicious and perfectly moist too! These look fabulous and I love the idea of squeezing a crumb muffin into a blondie :) Pinning! Oooh these look amazing! Soooo moist and perfect. I love blueberry baked goods! Oh these blondies look gorgeous, Rachel! Love the browned butter in here! As much as I love my mixer, it is really nice not to have to take it out all the time! These blondies sound amazing! I’m totally with you! Why dirty that big bowl if you don’t have to? Thanks, Ashley! Oh my, these look just so good! I think if there were a dessert I was most in love with (besides cake lol) it would be crumb bars and blondies – these combine those loves and I am pretty sure they deserve the title of bestest dessert – they look incredible! Pinned! Thanks so much for the sweet words and the pin, Phi! Love blueberries and blondies! This recipe sounds perfect! Pinning to try it! These look so soft and warm and delish! I’ll love blueberries forever and a day, especially in baked goods! Delicious! The sooner a yummy dessert can get into my belly the better! 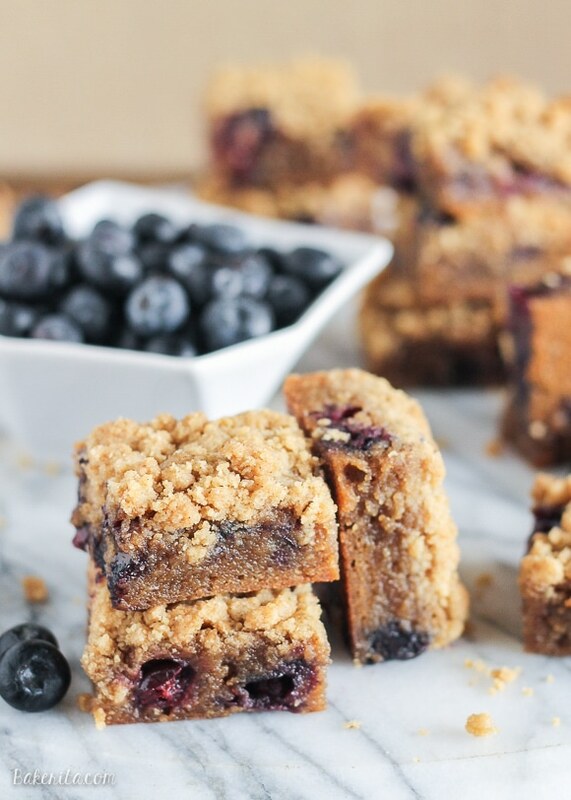 These blueberry crumb blondes look scrumptious and I was thrilled when I read I can use frozen fruit in them – as a have a bag of blueberries in the deep freeze. Fantastic recipe. Thank you. Sammie. Making these now for a 4th of july cook out!